The capabilities that define the 5G wireless standard will require utilization of wider bandwidths across more regions of spectrum than any current wireless technology. 5G communications will eventually occupy multiple bands from below 6 GHz to above 60 GHz. For now, much of the development effort is divided among sub-6 GHz bands for vehicular connectivity and longer-range transmissions, and the 26, 28, 38 and 60 GHz bands for enhanced mobile broadband applications. The migration to higher frequencies and the multi-band nature of the technology pose a variety of unique challenges for designers developing 5G devices and network equipment. Significant among these is the high cost of instrumentation for test and measurement over such a wide range of frequencies. Many RF test labs are already outfitted with test and measurement equipment capable of measurements up to 6 GHz. For companies venturing from applications below 6 GHz up to the 28 GHz or even 38 GHz bands, the cost of acquiring additional dedicated instrumentation supporting measurements up to 40 GHz can be prohibitive, increasing from tens of thousands to the order of hundreds of thousands of dollars. Fortunately, with some creativity and a few readily available components, customers can adapt the equipment they already have in the lab to perform testing on devices operating in higher frequency bands without the need for heavy investment in new equipment. This article describes a variety of relatively affordable setups using off-the-shelf Mini-Circuits components, which allow users to test devices operating in the 28 GHz band with a 6 GHz spectrum analyzer or network analyzer and a signal generator operating up to 6 GHz. Functional block diagrams are presented and explained along with recommended components and possible extensions. Let’s assume for our case that we want to assemble a test setup for uplink and downlink testing of 28 GHz DUTs using a spectrum analyzer and a signal source (synthesizer or signal generator), both with operating frequencies up to 6 GHz. 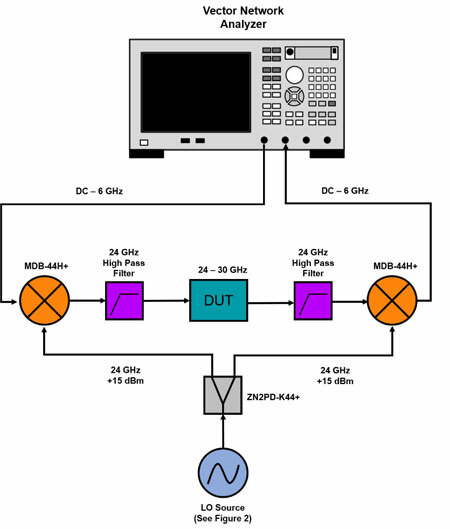 For downlink testing, a wideband mixer with an LO frequency of 24 GHz can be used to convert a 4 GHz test signal from the signal generator to 28 GHz to the DUT. For uplink testing, the same mixer can be used to convert 28 GHz from the DUT back down to 4 GHz into the analyzer. Mini-Circuits’ MMIC mixer model MDB-44H+ is ideal for this application. The mixer has an IF frequency range of DC to 15 GHz and an LO/RF frequency range of 10 to 40 GHz. It can be used as an up- and down-converter and provides low conversion loss with excellent harmonic suppression. The mixer is conveniently available mounted on a test board (TB-973-MDB44HC+) with 2.92mm Female connectors (required for frequencies above 26.5 GHz), readily allowing interconnection with 3.5 mm and SMA connectors on test cables, DUTs and test equipment. In order to realize the frequency conversion capability illustrated in Figure 1, a 24 GHz source is required for the LO to the mixer. To avoid the cost of a high-frequency generator, we’d like to use a 6 GHz signal source to generate the desired LO signal. In order to minimize component count and further reduce cost, we’d also like to split one LO source to drive both the up-converter and down-converter. Figure 1 • Up/down-conversion between a 4 GHz test signal from a spectrum analyzer and a 28 GHz device under test. The mixer MDB-44H+ operates on an LO level of +15 dBm, so our LO source should deliver two 24 GHz channels at +15 dBm. 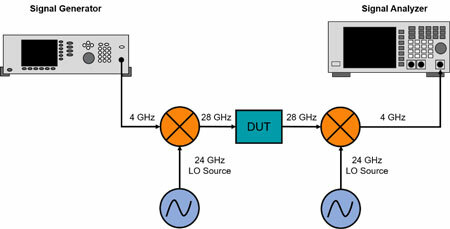 Figure 2 shows a basic structure using interconnected Mini-Circuits parts to multiply a 6 GHz signal from a synthesized signal generator up to 24 GHz. Coaxial amplifiers are used to correct the signal levels; reflectionless filters suppress unwanted harmonics at the multiplier output and absorb any signal reflections between elements in the chain; and an ultra-wideband splitter/combiner is used to distribute 24 GHz to each of the two mixer LO ports. Figure 2 • Basic structure to generate 2x 24 GHz LO sources at +15 dBm for up-conversion and down-conversion between spectrum analyzer and DUT. Note that this block diagram represents a concept that may be modified to the user’s requirements. Depending on the user’s actual application frequency, real-world losses and parasitic effects, different combinations of multipliers, filters, amplifiers and attenuators may be added to the chain to achieve the ideal signal frequency and power. Now that we have a means of frequency conversion between 4 GHz and 28 GHz and a 24 GHz source for our mixer LO, we can combine these elements to build a variety of useful setups. One example is the spectrum analyzer measurement setup depicted in Figure 3. 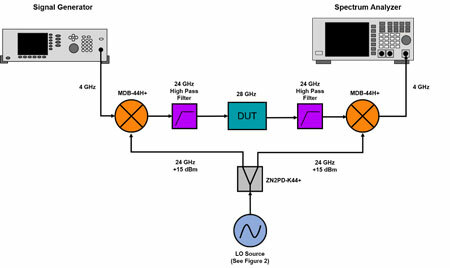 Figure 3 • Functional block diagram of setup to test 28 GHz user equipment with 6 GHz spectrum analyzer and signal generator. Note that this setup requires a high pass filter with a frequency cutoff at 24 GHz to suppress the lower sideband of unconverted signal. Mini-Circuits can provide filters for this purpose on request. As an interesting extension, the user may replace the spectrum analyzer with an oscilloscope to perform time domain analysis or real time analysis on 5G signals. 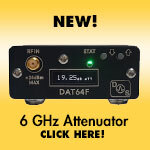 The same components used in the previous case may also be utilized to extend the frequency coverage of a low-frequency Vector Network Analyzer (VNA). The configuration in Figure 4 allows precise measurement of scalar ratios such as insertion loss, gain, and insertion phase at high frequencies with a more budget-friendly, lower frequency VNA. Figure 4 • Functional block diagram of setup to perform scalar test between 24 to 28 GHz on DUT with 6 GHz Vector Network Analyzer. 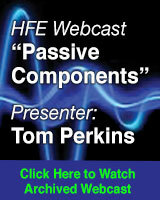 A more advanced approach may be realized with a VNA that has direct receiver access. Theoretically, full vector corrected measurements would be possible with the setup in Figure 4, but the losses of the mixers (~8 dB conversion loss) are significant enough as to affect the internal couplers in the VNA and hinder accurate calibration. To address that problem, external couplers can be used after the mixers to improve overall system directivity and enable accurate vector calibration and measurement. Figure 5 shows such a setup with full vector calibration and measurement capability. Note that a 4-way, 40 GHz splitter is used in this case, and a 24 GHz LO source with +21 dBm power is needed to distribute the LO signal into 4 channels. The couplers should operate in the 24 to 30 GHz range with a coupling ratio of approximately 20 dB to properly buffer mismatch in the receiver path. Mini-Circuits is currently developing couplers with a frequency range from 20 to 40 GHz, which are ideal for this application. 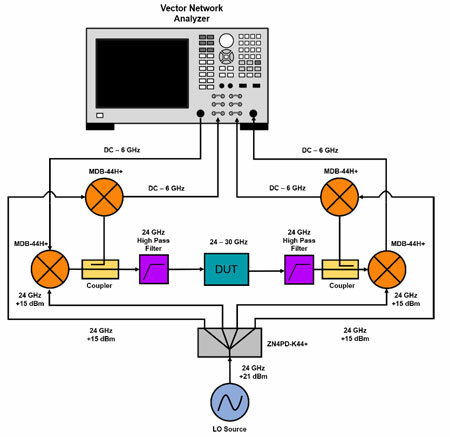 Figure 5 • Functional block diagram of a setup to perform vector corrected testing between 24 and 30 GHz on DUT with a 6 GHz Vector Network Analyzer. The up/down-converter is totally independent of the VNA system, and most of the VNA functions are totally transparent through the converter. The operator can adjust input power, perform power sweeps, linear segment sweeps, and logarithmic sweeps with the assumption that all frequencies applied to DUT are multiplied by a factor of 4. The overall loss of signal through converter should be less than 23 dB, which should not be an issue for most VNAs. VNA setups with up/down-conversion like those shown in Figure 4 and Figure 5 can be especially useful for high volume pass/fail production testing where the need for high frequency component testing often runs up against budget constraints. Figure 6 • Left to right, Mini-Circuits NM-NM50+, SM-SM50+, and KM-KM50+ adapters. The test setups illustrated here consist of various combinations of coaxial amplifiers, splitters and couplers as well as MMIC mixers, multipliers and reflectionless filters mounted on connectorized test boards. Therefore, a variety of adapters and cables will be needed for interconnection between components and to the signal generator and test instrumentation. The LO setup exactly as pictured in Figure 2 would require an N-Male to SMA-Male adapter (NM-SM50+) to interface between the synthesized signal generator and the first multiplier. The filter and amplifier at the 12 GHz stage can be mated with SMA-Male to SMA-Male adapters (SM-SM50+), and the components in the 24 GHz stage can be connected with 2.92mm-Male to 2.92mm Male adapters (KM-KM50+). Mini-Circuits has expanded our selection of adapters up to 40 GHz, introducing 3.5mm, 2.92mm (K), and 2.4mm connector types in all gender configurations. 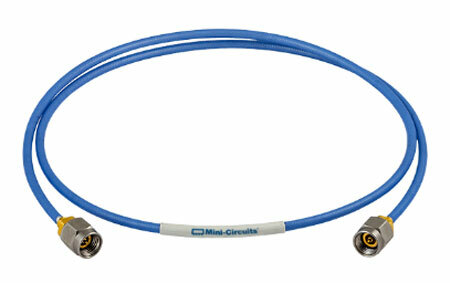 For connections requiring more flexibility, Mini-Circuits HandFlex cables are available in various lengths with a wide variety connector configurations up to 18 GHz and 40 GHz models with 2.92mm connectors. Figure 7 • Mini-Circuits’ 086-KM+ series 40 GHz HandFlex™ interconnect cable (left) and KBL-series 40 GHz precision test cable. High-performance test cables are also needed for a good connection at 4 GHz from RF source and analyzer to the mixer IF ports. 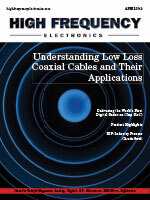 Mini-Circuits CBL-series 18 GHz precision test cables are excellent candidates for this purpose. The 28 GHz connection between the mixer RF ports and the DUT can be made with KBL-series precision 40 GHz cables. For additional utility and convenience, Mini-Circuits can build up/down-converter setups like those discussed in this article into a custom, 19-inch rack-mounted assembly with AC power input so the user can simply mount the equipment in their test rack without spending the time and effort involved in building their own assembly. The parts used in these setups are available in surface-mount packages, so customers can integrate up/down-converters into their PCB for Automated Test Equipment (ATE) RF test fixtures for production testing. The transition of commercial wireless applications from the sub-6 GHz spectrum region up to the millimeter wave bands poses challenges for test labs already outfitted for 4G LTE and other existing wireless applications. The cost of high-performance 26 GHz and 40 GHz instrumentation could effectively block budget-conscious companies and programs from entering the 5G space. This article illustrates an approach that allows designers and test engineers with 6 GHz lab equipment to test higher frequency devices without the need for heavy capital investment. The setups described here are merely examples, and customers may utilize similar approaches to develop setups for different frequencies, power levels, and other application-specific requirements. Mini-Circuits now offers ultra-wideband mixers and multipliers up to 40 GHz, both available in tiny surface-mount QFN packages and mounted on connectorized test boards, which in theory allows customers to build similar setups for testing in the 38 GHz 5G band as well. Jose Garcia and Miroslav Karas are employed at Mini-Circuits. JoseG@minicircuits.com; apps@minicircuits.com.